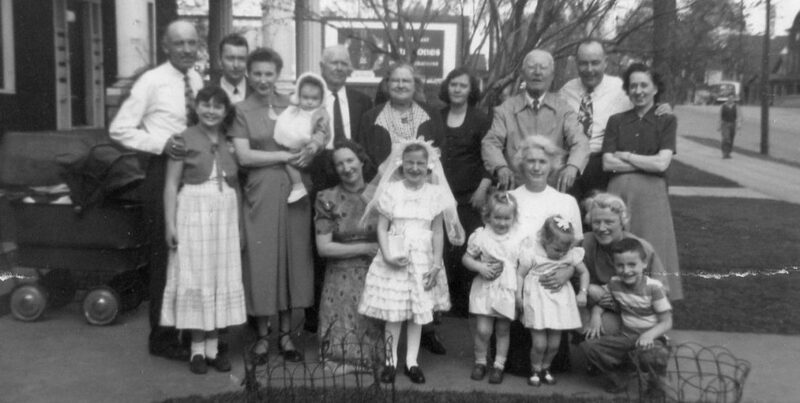 On several occasions I have mentioned my great-grandmother Annie Hill Regan and the small collection of photographs and greeting cards she left behind. Among the mysterious photographs from Manchester England, a photo-pin of a priest, and a charming Christmas card from a sister, are two memorial cards. Below is the card for her father who passed away the year before Annie came to the United States. 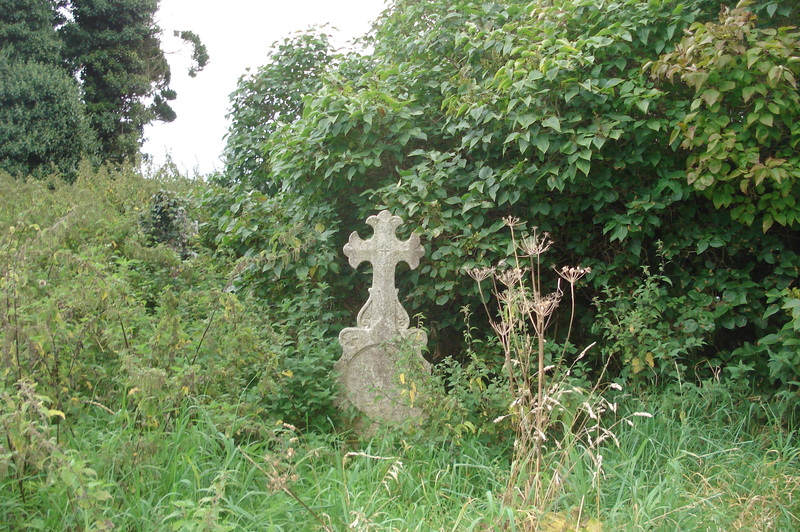 In 2009 I visited Rathmore Churchyard. I was unable to locate William’s grave, but I suspect it rests hidden in the overgrown grass, somewhere amidst the gravestones of Hill relatives of whom I am not familiar. The other card is for James Hill. 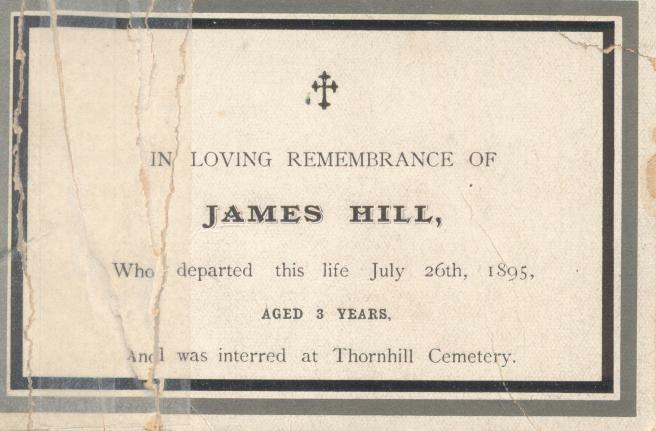 I assume James was a nephew, and one can imagine this loss was felt deeply by the entire family. Memorial cards can provide great information to the genealogist or family historian. In the case of Annie’s father, I knew his name from her birth certificate, but I learned his birth year, date of death, and place of burial only from this memorial card tucked into a stack of old photographs. But memorial cards can also raise more questions than they answer, and prove to be as frustrating as an album full of unidentified photographs or a postcard with faded text. Because they are so portable, I am sure a great many memorial cards crossed the Atlantic, mailed to emigrant daughters and sons in America, accompanying letters detailing all the latest news from home. Share your stories about how items like memorial cards have assisted you in the search for your family history. 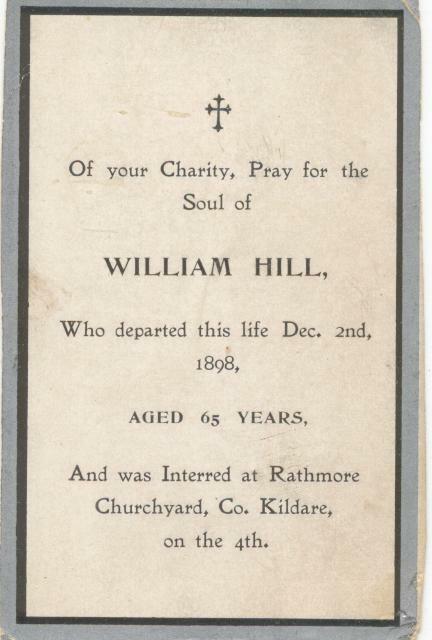 Perhaps a memorial card is all that is left to tell of an emigrant relative’s life in America? I would love to hear your stories, so please, leave a comment! Categories: Emigrants, Memories | Tags: Hill, Ireland, Kildare, memorial cards, Rathmore, Thornhill | Permalink. Memorial cards and writing memorial messages can be a very difficult time for a family as it is the final step after the funeral of a loved one.